Just finished, I hope successfully, a bit of 'can't hurt' fun roaming my ad territory, but neatly, and coincidentally, also possibly with a nice rub-off for Junkk.com. 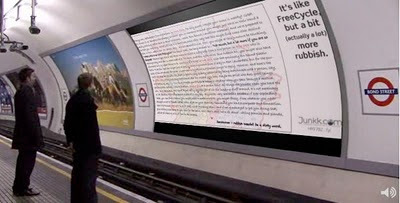 londonlongcopy.com is how I like my competitions (actually most things): fun & free. I was invited to take part a while ago, and determined this time not to leave it to the last minute. Fate somewhat intervened, in that I have only just got back after a wee spell enjoying the hospitality of the NHS. All well now, but a large hole in the month's traffic management plans. I had the idea, and I had the copy, and I had a rough layout. What I didn't have at 24hrs notice was an AD/designer. Fortunately, I have made some new chums. 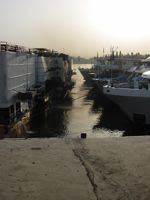 Taylor & Taylor (with pix on homepage of my fave ever bridge) just happen to be affiliated to the IP guys handling RE:tie's marketing, and what with one thing and another, the deed got done. Ta, guys. Didn't even make the shortlist:( Some nice ideas there, but frankly I think ours could have shared such good company too. Will never understand how judging works. I do so love it when they write themselves. Especially in a good cause. It’s the first ever liftshare Week from 4-8 October, and the aim is to help as many people as possible discover the benefits of car-sharing. The typical commuter who car-shares every day saves around £800 a year and a tonne of CO2, not to mention reducing their stress levels and having more fun. To take part in liftshare Week, just sign up to the free www.liftshare.com website and search for someone else going your way so that you can share the journey. You only have to do it on the days that suit you, and you can either take turns driving or - if one of you doesn’t have their own car - the passenger(s) can contribute to the driver’s petrol costs. Everyone wins. 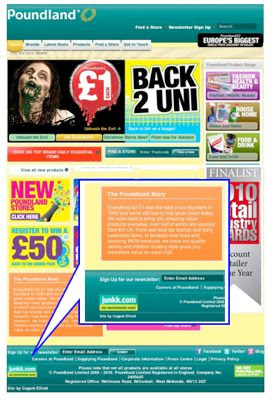 PR COVERAGE - And idea gaining traction? Actually, this is more IP coverage. But as it is a pretty nice article about what we're up to, I think it's worth sharing. WIPO is not an insignificant force in global IP, so to be noticed and so covered is a very nice thing to enjoy. Well, a bit like careless kings and troublesome priests, no sooner muttered than rushed out... without telling me! Nice 'n all, but I might have helped with the proof-reading too. Plus actually delivering as promised. Hence a bit of flashing around this weekend to get the new one up. Don't Be Shy, Schools and Shoppers - Choose Your Coconut Today! 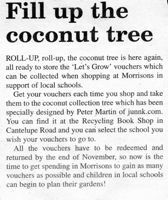 Another Autumn, another Morrison's 'Let's Grow' Promo. And, of course, in Ross-on-Wye at least, the Voucher Palm blossoms in complement again, made from all-reused materials by local eco-ideas website Junkk.com, to help shoppers around town 'post' their vouchers to donate to local schools. Two have so far have asked to have their own coconut on the palm, but there is space for plenty more. Plus plenty of room inside each to donate vouchers to the school of your choice. So when around town, if you have some vouchers in your wallet in danger of being lost in the back of the kitchen drawer, pop by the EnviroAbility Book Swap Shop, Cantilupe Rd to ensure they get to... and help make even nicer... some very good local home schools... and gardens. As some may know, Junkk.com enjoys a healthy relationship with Poundland. You know, the retail phenomenon that seems to be almost unique in going from strength to strength, somewhat against the trend? The one that does seem to have pegged what consumers want these days? But for all their commitment to value and savings on the pocket, they do ponder deep and long about ways to help make the planet a tad nicer place to be, too. Which is why, a fair while ago, having seen a Junkk.com stand plugging RE:tie at a show, they liked what they saw enough to want to help in our mission to encourage reuse. So they popped our URL on their packaging. And from this end, we can testify to just how that has caught on with their customer base. Folk like the notion... A LOT. Well, just as we had a cheery call that made our Friday a while back, we've just had another. Nice to be loved. And to be rated so highly via such an endorsement, compliment and complement from such a successful business. Maybe we are doing something right, as well as good, after all. Always nice to be noticed. Even better to be appreciated. Top cherry to be thought amongst the best. 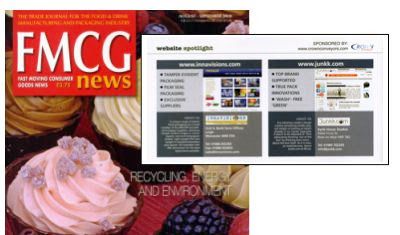 Junkk.com has been featured in this month's FMCG magazine 'Website spotlight'. Not too sure on the value as, so far, the phone has not be ringing off the hook. Early days? Folk in this industry are pretty time poor, and I've only just found it after it hit the in-tray a few days ago. Sons, sun & sand (lots of sand). Plus wife. 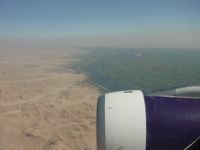 Full disclosure: we flew for 6hrs, budget class, to Egypt, for a Nile cruise. However, learning from many who ponder and post in the world of environess, I will attempt to justify a smidge of what we got up to by writing about it, especially a few eco-aspects of it all... good... but mainly not as good as one may have hoped. OK, we were in a sunny place. Make that sunny to the tune of 45 degrees some days, pretty much dawn to dusk. That... is a lot of energy falling on every sqm of a vast expanse, day-in, day-out. Trust me. As the only family not out the first day for a tanning session, we observed the results on the others. Yet... I could see no great evidence of any solar collection, domestic, commercial or national, either photovoltaics or even hot water. Bizarre. 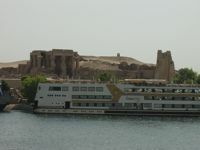 What I did note was the gentle chug of diesels, 24/7, which sadly results in a pervasive fug hanging over the Nile and its banks. Makes for nice sunsets, but not much else. 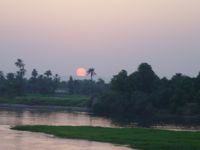 Now, a lot of this may be down to cheap 'leccy thanks to the Aswan dam. A rather uninspiring structure, TBH, but quite a feat. Actually, I was a bit more impressed with the one the British built several decades before. It also had the benefits of a lock system to allow navigation, something the Russians 'forgot' to add. Apparently. I suspect this may have led to, and still inspires some... frustration, downstream. Which brings me to the other eco-aspect from this trip: the importance of water. Look at that shot out the plane window: no water, no nothing. More than that, no irrigation; no growth more than a few yards in. The country is a high % of sun-blasted sand and little else. 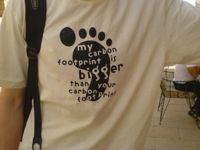 Man has a great capacity to harness nature for good, but also a great responsibility to ensure it is done properly. Sadly, as I write this I add below a URL that poses some of the dilemmas facing our own mega-water-harnessing scheme. Finally, I leave pondering a matter of historical interest, namely was the climate back in Ramases' time as oppressive as now?